Why is it everytime I import an image into Illustrator CC 2018 the image becomes smaller than the original dimensions? Therefore, I have to give each imported image their original dimensions to fix this problem, is there any way I could fix this issue? In Illustrator change your General Units in the Preferences to "Inches". 900px / 96ppi = 9.375"
701px / 96ppi = 7.3021"
Select the image, and it should show at the above size, displayed in inches, and Illustrator has done its job properly. Illustrator is scaling the image to the physical size calculated by the pixel dimensions divided by the PPI. This is what it is designed to do. Don't confuse Illustrator's "pixels" with the true pixel dimensions of the image. Illustrator technically has no pixels, since it's a vector image editor, not a raster image editor. But it uses 72ppi as its default for displaying images. You will notice that if you set the General Units to pixels in the preferences, it will now display the size as 675px x 525.75px. This is absolutely normal. You can ignore this, since it's not the true size of the image file. Let me explain . . .
What Illustrator is doing here is calculating the pixels according to Illustrator's default 72ppi. Essentially, 9.375" x 72ppi = 675px to make the image appear at 9.375", which is the physical size indicated by the ppi of your original image (which is 96ppi). You can check that the image is still the same size as it was originally in pixels. Select the image, and in the tool options along the top, click on the "image" link, hit the tiny menu icon and choose Link File Info, select the Camera Data tab, and scroll down until you see the pixel dimensions of the image. You will see that it's still 900px x 701px. If you don't want Illustrator to resize the image, then in Photoshop, set the PPI to 72 (making sure you don't resample the image), then Illustrator won't resize it when you place the image. When you set the ppi to 72, you are basically telling Illustrator to ignore the PPI. 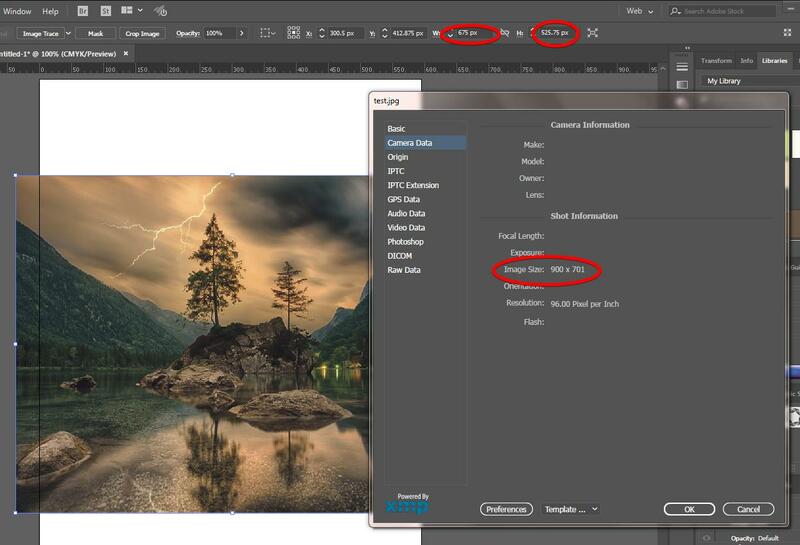 If the PPI information of the document does not match the PPI information of the image, Illustrator will "resize" it using the image information. If you have a ton of assets, but in a lossless format like PNG you could reassign PPI information in a batch process. You need to be careful to only reassign the PPI, not resampling them. Or you can change the PPI settings on your document. It is probably 300ppi and you could change it to 72 if that is what your project needs. I have fixed the issue by changing my capture software from Snagit to Bandicam, apparently Bandicam is more compatible than Snagit though in both softwares the images were captured in 96 dpi, and I could also get the same results from the default windows capture [PrtScn], but it doesn't have a window detection or anything so I had to get a software. Not the answer you're looking for? Browse other questions tagged adobe-illustrator images resize or ask your own question.